Prints + Process is a solo exhibition of works by Justin Myer Staller, which takes a look inside the artist’s process for completing a print project. 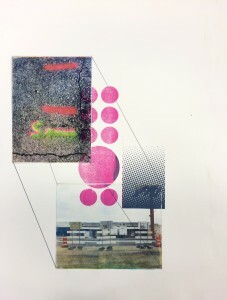 Staller’s work combines photographic collage with a combination of screenprinting and photopolymer printing. Prints + Process is presented as part of The Print Center 100. On view October 8 – November 25, 2015. Opening Reception: October 8, 6:00 – 9:00pm. Second State Press is a nonprofit communal printmaking workshop whose mission is to foster the development of ideas and innovation in printmaking by providing artists with a professional, affordable and supportive workspace.